The diagnosis of a Superior Labrum Anterior to Posterior (SLAP) Tear lesion is usually made by obtaining the history, imaging studies, and physical examination. Active compression test (O’Brian’s sign) – The active compression test has two parts and is performed with the patient standing. The patient flexes his/her shoulder 90 degrees with the elbow in full extension. Next, the patient adducts their arm 10 degrees (moves it slightly toward the midline). The patient internally rotates his/her arm until the thumb points downward. The examiner then pushes the arm toward the floor while the patient resists by maintaining their arm in the starting position. This first part of the test may elicit deep shoulder pain or a clicking sensation in the glenohumeral region. The maneuver is then repeated with the patient’s arm fully supinated. The test is positive if the pain or click is reduced or eliminated during the second part of the test. The elbow is flexed 90 degrees. The examiner then applies an axial load to the humerus with one hand while rotating the patient’s arm internally and externally with the other. A positive test results in pain, a clicking sensation during the maneuver, or reproduction of symptoms similar to those experienced at work or sport. The patient’s arm is extended in full supination with the shoulder flexed. The patient is then asked to elevate the arm against a resisted isometric force applied by the examiner. Imaging studies are always performed during evaluation of any orthopedic injury. Radiographic evaluation often starts with radiographs (x-rays) of the shoulder. Radiographs: Common diagnostic x-ray views include: anteroposterior, axillary, scapular-Y and Stryker notch views. While the labrum of the shoulder does not show up on an x-ray since it is soft tissue, x-rays can be used to rule out alternate causes of pain and symptoms such as arthritis, Hill-Sachs lesion or a fracture. Magnetic Resonance Imaging (MRI) – MRI is the gold standard radiologic test for evaluation of SLAP tears. MRI is used to visualize soft tissues such as the labrum. Many surgeons recommend use of a high-resolution non-contrast MRI to accurately diagnose SLAP tears. [vi] When there is suspected concomitant rotator cuff involvement, MR arthrography (performed with the patient’s arm in abduction and external rotation), provides accurate diagnosis. [vii] The characteristic finding of a SLAP tear includes a high signal (fluid on T2WI or arthrographic contrast on T1WI) extending into the superior labrum, and tracking into the labrum or biceps tendon. Ultrasonography – Ultrasonography, though rarely used, has been show to accurately depict labral tears and associated fractures in patients with anterior shoulder instability. [viii] It also helps detect other conditions in patients who have shoulder pain, such as full-thickness tears of the supraspinatus tendon, tendonitis of the long head of the biceps, and tears of the biceps. 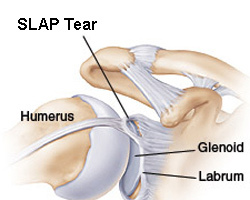 In most cases, the first line treatment for a SLAP tear is non-surgical and includes anti-inflammatory medication, rest and physical therapy. Non-steroidal anti-inflammatory medication is often used; this includes medications such as ibuprofen and naproxen. Other medications such as prescription pain relievers can be used to alleviate discomfort. Conservative Management: Conservative management (non-surgical treatment) of SLAP has been shown to be unsuccessful in most patients. A trial course (6 to 8 weeks) of physical therapy and rehabilitation is recommended for patients who are not professional athletes. If pain and mechanical limitations persist, then surgical treatment should be strongly considered. [ix] Post-operative Outcomes: Most patients report good to excellent results, with little or no physical restrictions within 3 months after arthroscopic surgical repair. [x], [xi], [xii] However, the results were not as good in patients who were throwing athletes. [xiii] Therefore surgical treatment of Superior Labrum Anterior to Posterior (SLAP) Tear due to over-use in athletes who throw over-head may be less successful than in other patients.